Privacy, aluminum, colorbond or timber fencing - we can install many types of fences! Whether you need to repair an old fence or to install a brand new one, the Fantastic fencing contractors in Melbourne are more than qualified to take care of the task. Our speciality is timber fencing, but we are equally able to fit your Melbourne home with colorbond fencing. Or any other type you’d like for that matter. The fencing specialists can tackle anything you need done to your yard’s perimeter. Regardless if you're selling or just have bought your house having a fence installed is a great advantage. You can choose between a wide range of styles or materials - containment, privacy or decorative fences- to increase your home's curb appeal. There are a number of benefits when you add a new fence around your home. You won't have to worry if your yard is exposed to the public gaze. You won't have to wonder what pest wandered off your property this time. You'd be able to enjoy the silence after a tiresome day at work. A new fence will give your family and you additional security. You'll increase the value of your home, the perceived living space and its curb appeal. Learn more about our fencing service in Melbourne! Q: What Information Do I Need To Provide You With Prior The Job? A: We need to know the type of fence you need to install. Have in mind that for the base, the posts need to be secured with concrete. We need to be able to dig 50-70 cm in the ground. Before installing the fence, we'll probably advise you to let us apply a coat of paint first., to ensure not a single spot is missed. After the fence is installed, some parts of it are hard to paint. Q: What Fences Can You Install? A: The technicians can install decorative and privacy wooden fences, metal panels and mesh fences and a lot more. Also, we can assist you with noise cancelling, containment, chainmesh, aluminum, tubular steel or other fences. Q: Do you provide fence repairs? A: Yes, we do. In fact, we often advise our customers to consider repairing their fences before making a decision to replace it. If part of your wooden fence has started to rot, you can count on our carpenters in Melbourne to replace bad slats, pickets or posts with the same type of wood. We also repair brick, aluminum, PVC, wrought iron, vinyl, chain link, and other types of fences. Simply contact us and let us know what you need, and we'll do it, even if it is a simple fence painting job. 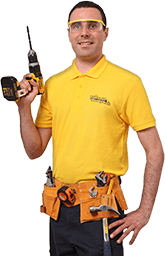 Q: Why Should I Hire Fantastic Handyman Melbourne Technicians? А: We are one of the leading home improvement companies in Melbourne which offer excellent repair services at reasonable rates. The fencing experts have been thoroughly trained and have all the right tools and experience to deal with the job.